In the popular imagination, Howard Phillips Lovecraft is synonymous with “recluse.” It’s quite understandable: Who wouldn’t want the man responsible for Cthulhu and other eldritch horrors to be a ghoulish shut-in? But the truth is that this is a misrepresentation. Lovecraft was an eager traveler, and besides writing to his many friends scattered throughout the United States, he also frequently visited them. He visited not only all of New England, but he even made it out to Florida, New Orleans and Cleveland. 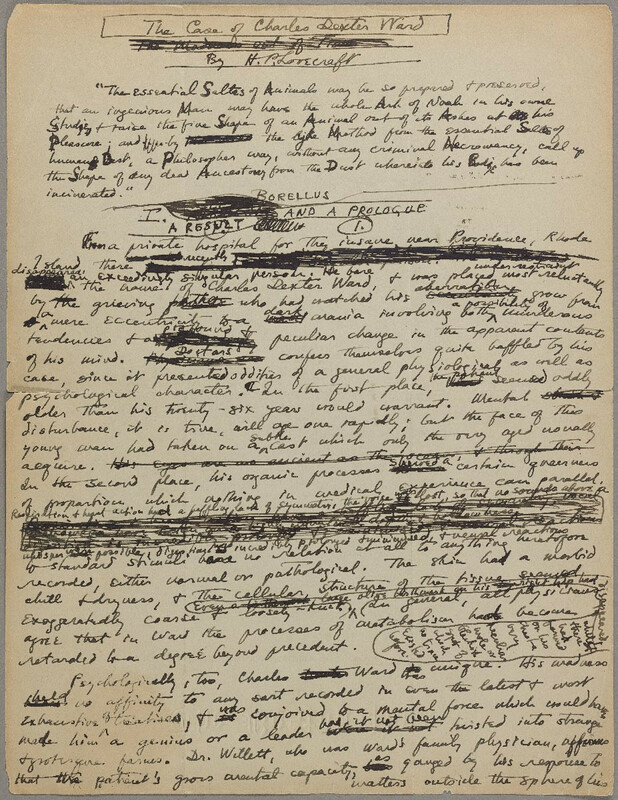 In fact, his essay “A Description of the Town of Quebeck,” which is an account of his trip to Quebec City, is Lovecraft’s longest work ever at 136 pages. Lovecraft, unlike many of us, had an almost unlimited ability to travel. Chronically unemployed but with many friends owing to his extensive correspondence (Lovecraft was one of the 20th century’s most prolific letter-writers), Lovecraft at times enjoyed a type of lifestyle normally out-of-range for a man of his poverty. These friends, who often received advice or hammered-handed corrections of their work from Lovecraft, were happy to have the old gentleman from Providence for a stay. Luckily for the history of horror writing and science fiction, Lovecraft’s circle of friends would also go on to become some of the biggest names of the genres’ so-called “Golden Age.” Among them are Robert Bloch, author of Psycho, Robert E. Howard, the creator of Conan the Barbarian, August Derleth and Donald Wandrei, the founders of the publishing imprint Arkham House, and even the celebrated poet Hart Crane, whose The Bridge Lovecraft liked very much. Written in 1929, Long’s short story was so spectacular that Lovecraft even mentioned it in one of his own stories, 1931’s “The Whisperer in Darkness.” The story’s titular hounds are strange, primordial beasts who inhabit the “angles” of time and space, and lust after human life, which is primarily descended from “curves.” Influenced by Long and Lovecraft’s interests in non-Euclidean geometry, “The Hounds of Tindalos” is a weird tale based in even stranger mathematics. Arguably the best Cthulhu story written by someone other than Lovecraft, Howard’s “The Black Stone” was published in the November 1931 issue of Weird Tales. In the short story, poet Justin Geoffrey travels to Hungary in order to appease his growing interest an obsidian obelisk; what he finds there is too horrible to reveal. Unlike many of Lovecraft’s other friends and proteges, Howard and Lovecraft never met in person, for Howard rarely left his beloved Texas. Sadly, despite being 16 years younger, Howard went to his grave a year before Lovecraft from a self-inflicted gunshot wound. While some writers from Lovecraft’s loose collection of friends and collaborators went on to become famous in their own right, Smith, an incredibly creative and talented author, has largely been forgotten. Making all of this worse is the fact that he is often regarded as superior to Lovecraft, with Lovecraft himself calling Smith “an American Baudelaire” in a 1921 letter. Also published in the November 1931 issue of Weird Tales, Smith's “The Tale of Satampra Zeiros” introduces Tsathoggua, an ancient deity often described as a squat, black toad. Told in the high fantasy style of Lord Dunsany, “The Tale of Satampra Zeiros” is a theft-gone-wrong story of the darkest hue. Tsathoggua would later appear in Lovecraft’s fiction of the 1930s and in the work of other writers who’ve found this particularly loathsome being inescapable. In the early ‘30s, Bloch was just a Jewish kid in Milwaukee who loved the pulp magazines of the day. But unlike his peers, Bloch aspired to turn his voracious reading into bountiful writing. Sometime in 1933, Bloch wrote a fan letter to Lovecraft, who was one of his favorites. The author replied with words of encouragement and gave the young man advice on writing. Bloch repaid this kindness by killing off a character in 1935’s “The Shambler from the Stars” that bears more than a passing resemblance to Lovecraft. (Lovecraft made sure to get his payback in 1936’s “The Haunter of the Dark,” which is dedicated to Bloch and in which a Bloch-lookalike named Robert Blake from Milwaukee — the character’s address was Bloch’s real address at the time — is gruesomely killed by yet another one of Lovecraft’s hideous extraterrestrials.) Centered around the ingenious creation of the star vampire, a tentacled, gelatinous creature that is made visible only when undigested blood courses through its system, “The Shambler from the Stars” is an early indication of the master that Bloch would eventually become. The first short story that Kuttner ever sold, “The Graveyard Rats” was published in early 1936 by Weird Tales and remains one of his most-anthologized works. Set in Salem, Massachusetts, it is a noxious tale of a grave-robbing cemetery caretaker and a teeming horde of zombie-like rats who can’t stop from consuming corpses in the churchyard. Although this tale owes a lot to Lovecraft’s 1925 story “In the Vault,” Kuttner would soon breakout of the Lovecraftian mold and start writing some of the most influential science fiction stories and novels of the genre’s early years. As a side note, Kuttner’s wife C. L. Moore wrote the tremendous 1934 story “Black God’s Kiss,” which shows the influence of Lovecraft through the prism of Robert E. Howard and the sword-and-sorcery genre.